The WRT Portable Exchange Systems (PES) are designed for various contaminant removal applications from 5 to 100 gallons per minute. 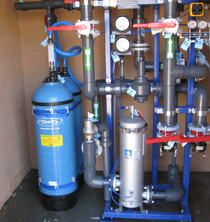 Z-88® Radium or Z-92® Uranium removal systems can be utilized in any new or existing potable water system. Water passes through treatment vessels where the contaminant is removed. When the treatment media is ready for replacement, the portable treatment vessels are removed from the circuit and replacement vessels are provided and installed on a cost per exchange basis. WRT disconnects the used vessels, installs the replacement vessels into the system, places it back into operation, and provides for the safe removal and disposal of the spent media. View WRT installation reports here. Want to learn more about our Portable Exchange Systems? Contact us.